Thousands of years ago, catastrophic flooding destroyed a land bridge that connected Britain with the rest of Europe. The British can thank catastrophic flooding for isolating them from the rest of Europe, a new study confirms. Sometime between 450,000 and 200,000 years ago, at least two major floods — including one of the largest ever documented — separated Britain from Europe, making it an island. Altering river drainage patterns, the ancient floods greatly changed the landscape, and researchers say this new understanding of Britain’s past geography can help clarify questions about early human migration in the region. The idea that catastrophic flooding made Britain an island is not new, says Sanjeev Gupta, a geologist at Imperial College London and lead author of the new study, but it had never been tested. 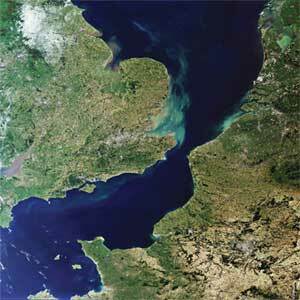 More than 500,000 years ago, a chalk ridge spanning what is today the Dover Strait joined southeastern Britain with northern France, so that even during warm periods when the sea level was high, as it is today, a land bridge connected Britain with continental Europe. In 1985, geologist Alec Smith suggested that, at some point, waters breached the ridge during a catastrophic flood that made Britain an island. Others, however, have suggested the breaching was a more gradual process caused by fluvial erosion from northern Europe’s rivers. After discovering the debate while browsing through the library, Gupta and his marine geophysicist colleague Jenny Collier set out to settle the question by using sonar equipment to map out a section of the seafloor near the Isle of Wight off the southern coast of England. Combining their results with 24-years’ worth of similar data collected by the United Kingdom’s Hydrographic Office and the Maritime and Coastguard Agency, Gupta and colleagues published their resulting view of the English Channel’s seafloor in Nature on July 19. The results show there were at least two major floods. The first probably occurred around 425,000 years ago, Gibbard estimates, after ice sheets from Scandinavia dammed up water from rivers flowing into the southern part of the present-day North Sea, creating a lake with the chalk ridge forming its southern border. It was like a tap filling up a bathtub that no one turned off, he says, and the water eventually overflowed, unleashing a torrent of turbulent water that wore down the chalk ridge and changed the drainage patterns of rivers such as the Thames, so that they flowed through the English Channel basin. Two-hundred thousand years later, a similar flooding event further wore down the chalk ridge so much so that Britain became an island, making the Dover Strait a permanent fixture of the landscape during warm periods. The floods also affected early humans who inhabited the region. Early humans first reached Britain by at least 700,000 years ago, but their settlement wasn’t permanent. “Prior to the flooding, humans colonized, retreated and recolonized Britain several times,” says Nick Ashton of the British Museum in London. These populations preferred Britain during temperate times, using the land bridge to get there when it was warmer and retreating south when it was colder, he says. Humans are conspicuously absent from Britain from 180,000 to 60,000 years ago, however, despite a warm period during this time, Gupta says. Britain’s transformation into an island may explain this. But even during times when the sea level was lower, the river system that formed after the floods would have been an obstacle to both humans and animals migrating to Britain, says Chris Stringer of the Natural History Museum in London. Mark White, an archaeologist at Durham University in the United Kingdom, agrees. “The seafloor models produced by the recent research show that the landscape would have actually been heavily dissected and incised, with many different barriers to movement,” he says, which has given him a new perspective on Britain’s ancient geography.